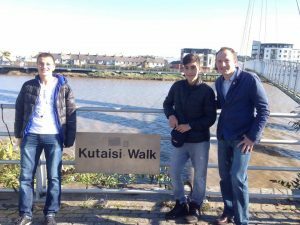 At the beginning of October Nikoloz Rukhadze, Baaka Gibradze and Givi Mukbaniani came to Newport by an invitation given by Gôl Cymru, the Welsh Football Association and hosted by NKTA. 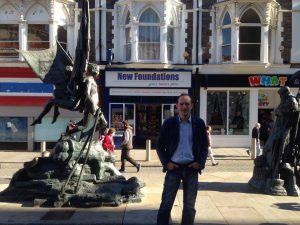 A full programme of activities was planned in Newport, Cardiff and Barry, ending with a visit to London via Windsor, before returning to Kutaisi. 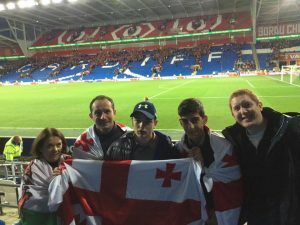 The invitation was to attend the Georgia v Wales 2018 World Football Cup qualifier’s match on Sunday 9th October. They were to act as mascots by escorting the Georgian team on to the field at the start of the game. 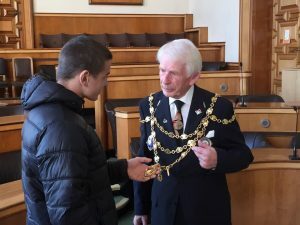 Beforehand they experienced a week of many exciting adventures and meetings with Newport Civic representatives and others who live & work in the city of Newport. Arriving in Newport after a long journey by air and road their first experience was to receive hospitality at Newport County Football ground to watch a Newport v Swansea game resulting in a score of Newport 1 Swansea City 2. Followed by a meeting with the Mayor of Newport Cllr. David Atwell & the Mayoress Mrs David Atwell. 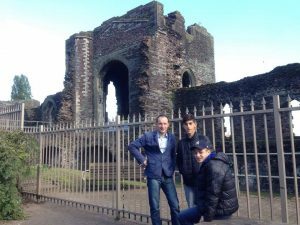 Newport’s South Wales Argus newspaper covered the boys’ visit. 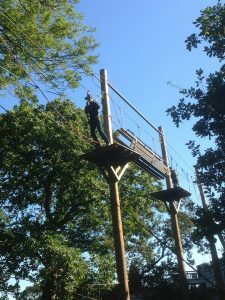 After the visit to the Civic Centre they experienced a Tree Top Adventure at the Celtic Manor Resort, Newport, a local 5* hotel that gave the visitors this amazing and exciting experience. 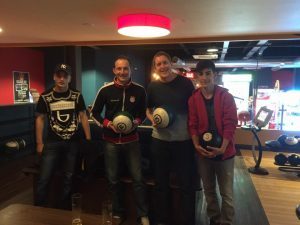 The evening was spent with Stephen Marshall at Super Bowl playing two games of bowling and two games of Laser Quest. 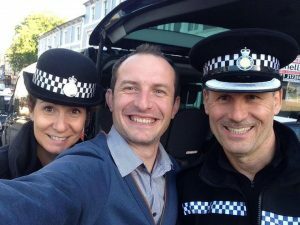 On Thursday a visit was made to the Gwent Police Department to meet with Chief Supt. Glyn Fernquest. 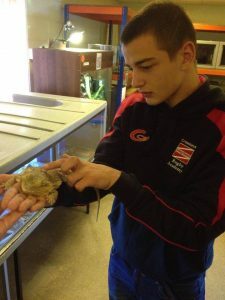 Following day a visit to Coleg Gwent where they attended a training session with the Newport Dragons Youth Rugby team and later to Usk College’s equestrian centre and small animal department. That evening a meal with NKTA Chair, Sonia Fisher, Dame Rosemary and Derek Butler and Nerys Hughes at the New Inn, Langstone. 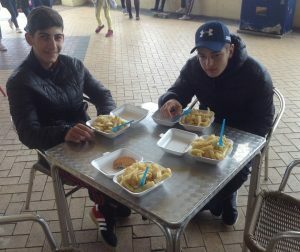 On Saturday, with David Collins of Gôl, the group visited Barry Island, a very popular seaside resort in South Wales. Then Sunday 9th October – the day of the final event – Wales v Georgia match in Cardiff. Givi and Baaka were the official mascot escorts walking on to the pitch escorting the Georgian National team. The Georgian team acknowledged the support of the Georgian visitors. They had spotted the Georgian flags during the warm up and came over to the stand to clap the Georgian boys, to the huge delight of Givi, Baaka and Niko. So WALES 1 GEORGIA 1 it was! 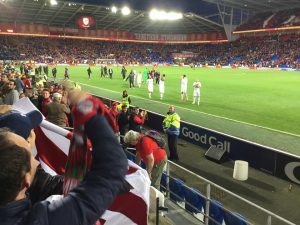 BBC “Good Morning Wales” programme referred to the match on Sunday and how Wales has closer links to Georgia than many people in Wales realise. It mentioned Newport’s links with Kutaisi and featured the comparison with Welsh and Georgian choirs by playing a short recording of a Georgian choir. The caves in Kutaisi were also mentioned. The programme presenter interviewed a Welsh football fan and Georgian football fans, Gôl’s David Collins and Nikoloz Rukhadze. 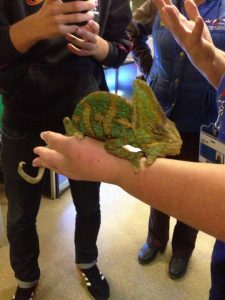 It was very exciting for NKTA, as an Association, to be given such a high profile by the BBC. 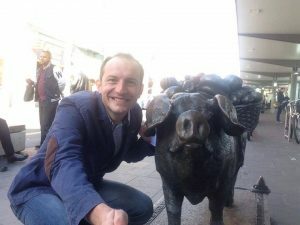 After the match Neil Dymock, from Gôl, took them to Windsor for an overnight stay but before leaving the next day they visited the castle, travelling on to central London for a sightseeing tour, returning to Kutaisi the day after. NKTA would like to thank Gôl Cymru for their sponsorship and making this visit possible. Also to everyone involved who gave their support. Nikoloz Rukhadze, Baaka Gibradze and Givi Mukbaniani will remember their visit forever. 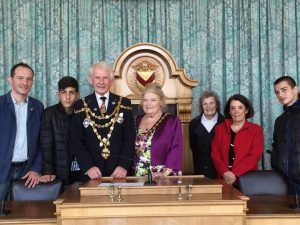 Please look at Newport Kutaisi Twinning Association Facebook page where you will find many more photographs from the week’s events. 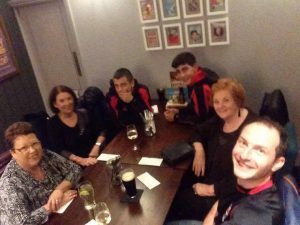 “The past week has been amazing thank you for all who followed the adventures of our Georgian guests…..” from FB Page. 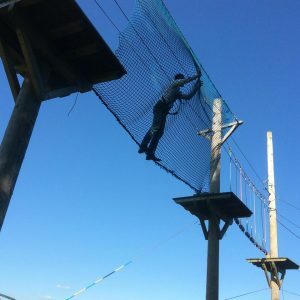 We are always looking for new people to get involved – you don’t have to have visited Georgia, but have an interest in the country, its culture and people – the rest will flow from there. 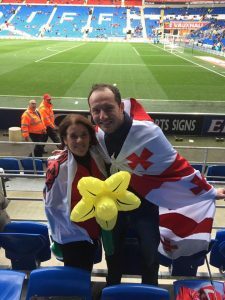 This entry was posted in Uncategorized and tagged Cardiff, Georgia, Kutaisi, Newport, wales, WalesVGeorgia, World cup 2018. Bookmark the permalink.